A gyro ring (also called a jitter ring) consists of a big metal ring with washers inserted into it. To get it going you give the washers a spin and then start turning the ring, as shown in the video below. This keeps the washers spinning. For as long as you keep turning the ring, the washers will keep spinning. The friction between the ring and the washers is what keeps the washers spinning. The faster the ring is turned, the faster the washers spin. The washers essentially roll, without slipping, along the ring. This is due to the friction force between them. 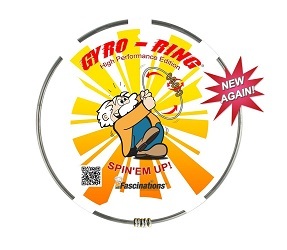 As the washers spin, gyroscopic precession causes them to touch the ring and lean to one side. At the point of contact between the ring and the washers, a friction force occurs. This force has an upward component, which prevents the washers from falling down the ring. This force also has a component in the direction of the washers spin, which is what makes them spin. As long as the ring is turning upward relative to the washers, the contact force between them will keep the washers spinning at a certain height up on the ring.